That Owen Jones is a fine propagandist, pamphlet writer, is clearly and obviously true. The sadness is that this talent, skill, seems unsullied by any great knowledge of the world he desires to change. Today’s he’s following the party line – not something we expect him to deviate from that often – in complaining about the number of hours we all work. Oblivious, entirely, to how the working week has been shrinking for a couple for centuries now. For the basic economic story of that past couple of centuries has been that we’ve all got richer. And richer people simply do take some part of their greater wealth in more leisure. We’ve simply no evidence whatsoever of any human population doing any different. We are unlikely to spend our last moments regretting that we didn’t spend enough of our lives chained to a desk. We may instead find ourselves rueing the time we didn’t spend watching our children grow, or with our loved ones, or travelling, or on the cultural or leisure pursuits that bring us happiness. Alas: the average full-time British employee works 42 hours a week, well over a third of the time we are awake. Some of our all too precious time is being stolen: British workers do around two billion hours of unpaid overtime each year. So it is extremely welcome that Labour’s John McDonnell has approached eminent economist Lord Skidelsky to head an inquiry into potentially cutting the working week to four days. It should be part of a new crusade for the left: of defending and expanding personal freedom. The champions of free market fundamentalism promised their creed would bring us freedom. But it wasn’t freedom at all: from the lack of secure, affordable housing to growing job insecurity and rising personal debt, the individual is trapped. Nine decades ago, John Maynard Keynes predicted that technological advances and rising productivity would mean that we’d be working a 15-hour week by now: that target has been somewhat missed. It’s not been missed at all. It’s just that people are missing where those working hours have disappeared from. Keynes himself, despite his mention of the charlady, not quite getting it himself. An upper middle class man in a world of servants might be excused the error, we not so much. The essential point to grasp being that “working hours” are the sum of those paid, market, working hours done for The Man and those unpaid working hours done inside the household. It is that second set of hours which have faded away. 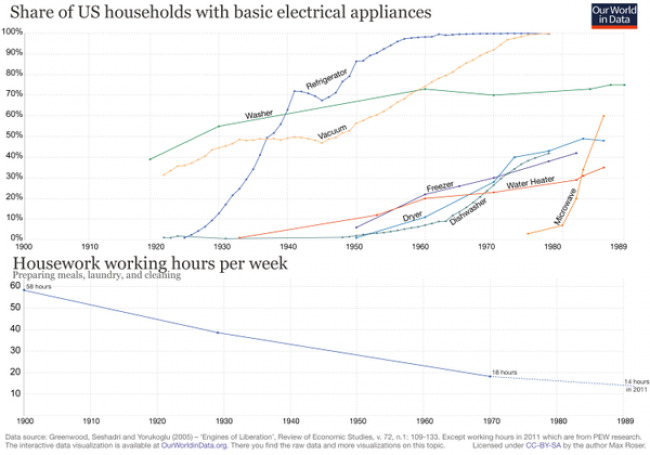 One, perhaps overcooked, estimate was that in the 1930s it took some 60 hours of unpaid domestic labour (or, in higher income families, servant paid labour) to run a household. Mangles, coppers for boiling the washing, coal stoves requiring blacking and on and on. Today, perhaps 15 hours, given washing machines, drip dry, microwaves and the rest. Keynes wrote a lovely little essay, Economic Prospects for our Grandchildren, in which he airily forecast that in a century’s time (he wrote in 1930) we would all be working 15 hour weeks. For we would have, essentially, conquered the economic problem of scarcity. Every month or two someone new pops up to complain about this. Well, Keynes said we’d only be working 15 hours soon enough so why are we all still working 40 hours a week? Are we being oppressed by capitalism or something, gouged by the plutocrats? Why don’t we all just take the pedal off the metal and enjoy ourselves more? The problem with this complaint is that Keynes’ 15 hour work week is in fact here already. He was absolutely spot on in general but inaccurate in detail. It is this wonderful chart (drawing on this data) from Max Roser which tells us both why Keynes was right and wrong: and also what people aren’t noting today. It is the bottom part that is important there, the decline in household working hours. Or if you don’t trust me, how about the Federal Reserve? weeks of vacation per year, assuming a 40‐hour work week. At which point a little note to Owen Jones. You do indeed have a fine talent for that putting words in order thing. I envy it for one. But could you just try to get a little more up to speed on the world outside the window? You know, that inconvenient reality thing? Next articleHow Does Anyone Think We Can Beat Poverty?